Looking at the ploughed-up earth where some believe the Bessborough babies are buried, it's hard to see this as anything but a further insult to families and survivors before the Mother and Baby Home site can be flogged to private developers, writes Donal O’Keeffe. In 2014, as the Tuam Babies story broke, I was contacted by a woman called Bridget. What she told me was heart-breaking. “I had a beautiful baby boy, born in Bessborough in 1960 (who) died at six weeks, (and I was) myself lucky to have survived with the same infection; was told a dirty needle. I hadn’t known where my son was buried until 15 year ago when I plucked up enough courage to confront the nuns at Bessborough. “Although I was a so-called inmate in Bessborough at the time of his burial, I was not allowed to be at his burial. It breaks my heart not knowing if he was dressed in a gown, or even if he was laid in a coffin. “To this day, 54 years later, (I am) still trying to come to terms with the horror of it all. I visited the grounds of the old Bessborough Mother and Baby Home in mid-February with Alison O’Reilly and Sheila O’Byrne. Alison broke nationally and internationally the Tuam Babies story. I’ve written about Sheila here before. In 1976, Sheila gave birth to her baby son in St Patrick’s Mother and Baby Home on Dublin’s Navan Road. That was, until last year, the last time Sheila saw her little boy. He was, like so many more, illegally adopted. Sheila is a hero. It was a cold evening as we walked down the long pathway to the nuns’ graveyard, primroses on the left and daffodils on the right, and at one point we walked on a pink carpet of rhododendron petals. It’s a straight walk, heading east, to the white gate of the graveyard, and to the right of the gate stood the castle folly, a pretty, three-story stone ruin. All around is the waste ground where many survivors believe, are buried the babies of Bessborough. Stepping through the gateway, we entered the nuns’ graveyard, a rectangular space approximately 40 feet long by 25 feet wide, the final resting places of 26 of Bessborough’s nuns. The north-facing wall of the castle folly, a semi-ruined two-storey stone structure dating back to 1870, was to our immediate right. Turning left, we walked up the short gravel pathway at the centre of the lawn. To the left was a double row of small black metal crosses. The nuns’ lives can only be imagined. Were they young girls when they were sent to the convent? Did they have any choice? Was kindness shown to them? Were they happy? Were they kind themselves? Sister Josephine 1976. Sister Assumpta 1976. Sister Euphrasia 1973. Sister Eustella 1972. Mother Helen 1967. Mother Joan 1968. Mother Genevieve 1956. Mother Stanislaus 1957. The top of the nuns’ graveyard is marked by a small white statue of Jesus at the graveyard’s north wall. Snowdrops grow below the statue. Sister Elizabeth Byrne 2006. In Loving Memory of SR. JOAN MADDEN Died 23rd March 2010 Aged 88 years Professed 67 years Rest In Peace. Below stood various small statues and stone memorials, including a striking half moon sculpture depicting a large face and a small face symbolising mother and child, and one particularly affecting statue of a child’s teddy bear. All around were floral tributes and children’s toys. It's hard to avoid the suspicion that the nuns would never have voluntarily shared a graveyard with the Bessborough babies, and “the angels’ plot” seems a recent innovation. In 2014, the Irish Examiner reported that an official investigation by the Cork County medical officer had in 1943, confirmed an infant mortality rate of 68% at Bessborough. The government briefly stopped sending women there as a result. The Mother and Baby Homes Commission has yet to carry out a geo-physical examination of the Bessborough grounds, but survivors and their families believe there are hundreds of babies buried there. Death registers record 470 infant deaths at Bessborough. Conall Ó Fátharta of the Irish Examiner reports that babies in Bessborough were buried in unmarked graves as late as 1990. On Tuesday morning last, I went out to Bessborough. 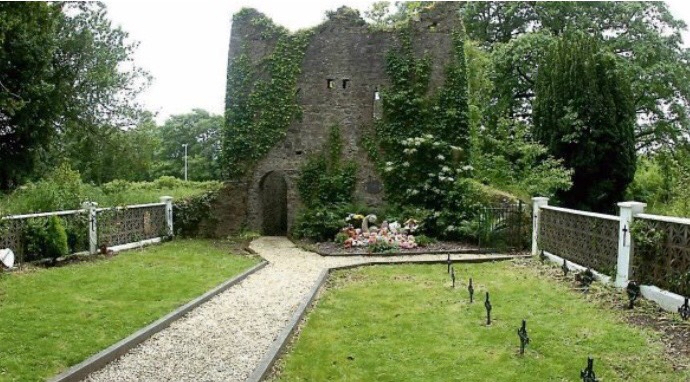 The Irish Examiner had reported the previous week that renovation work had begun on the structure, after a sign had appeared on the graveyard gate claiming the folly presented a “major health and safety hazard due to crumbling mortar and loose stones”. The Sisters of the Sacred Hearts of Jesus and Mary, the order which owns the Bessborough site, did not answer questions about the work, saying it would “deal directly with the Commission on all related matters”. It confirmed that it had informed the Mother and Baby Homes Commission of the work and that “a representative visited the site”. The castle folly had been demolished to the ground floor, and in its place stood a huge pile of rubble. The stone bench had been dismantled and placed on the central pathway, its seat cracked down the middle. The little stone teddy bear had its leg snapped off. In a further insult, the waste ground around the castle folly – where survivors believe the Bessborough babies are buried – was ploughed up and muddy as a result of the demolition. Several Cork City councillors condemned the demolition last week, and in a characteristic piece of post-horse stable-door maintenance, the council’s planning department has opened an enforcement file and ordered all work on the site to cease. Alison O’Reilly asked the Mother and Baby Homes Commission for a comment on the castle folly’s demolition. Its reply was succinct. The Sisters of the Sacred Hearts of Jesus and Mary put Bessborough up for sale two years ago, and expect to make multiple millions. Survivors are demanding the sale be halted. It’s strange, isn’t it, the way sites of socio-religious atrocities have a habit of burning down or accidentally being demolished just before they can be flogged to private developers? I stopped by Bessborough last Friday evening. Darkness was falling in that lonesome place, and rain was falling too. The sound of traffic from the link road was interspersed with birdsong from the trees. The nuns’ graveyard and the surrounding ground was entirely sealed off by metal fencing. The rubble of the castle folly had been removed away to the left, to an adjacent field of waste ground. The fencing was screwed tight, and wired together. I thought about how awful it would be to visit this lonely acre, and to want to pay one’s respects to loved ones, only to find the way barred. I thought of those poor babies, buried in unconsecrated ground, and I thought of how desperately a very rich religious organisation would dearly love for us all to forget those children so the potter’s field, that was their final rest, can be sold for development. Later, as I walked away, I thought how terrible it would be if someone had spent, say, half an hour untwisting wire, and wrestling big metal fences until they eventually popped open and made the way clear – at least for the bank holiday weekend – so grieving families could pay their respects. I thought too of the babies’ mothers, their children wrenched from their arms, and condemned to a life of suffering and grief. I thought of the Sisters of the Sacred Hearts of Jesus and Mary, and the untold millions they will make from the sale of Bessborough.